Available in four different sizes, the Mackenzie Backpacks are full of pockets, straps, and gear loops so that your child can stay organized while at school. We love the variety of colors, patterns, and the option to personalize with your child’s name or initials! Available at Pottery Barn Kids. Making this the most perfect lunchtime combo since peanut butter and jelly, the Rodgers Lunch Box perfectly fits inside any STATE backpack. It comes fully insulated with a zip around flap, and two see through pockets for notes or pictures to your little munchkins. The Rodgers is touched off with the signature STATE rivet in red. This S’ip by S’well water bottle lets you quench your thirst from dusk till dawn. Using authentic S’well® technology, our 15oz container will keep beverages cold and hot longer than your average bottle. S’ip by S’well is made from BPA-free double-walled food-grade 304 18/8 stainless steel, and fully tested for healthy hydration. S’ip it cold, S’ip it hot, S’ip a drink that hits the spot. Start the school year off right! This set includes durable, waterproof labels needed to keep your things out of the lost and found. But them on backpacks, school supplies, clothes, and more! That is the question with this super cute eraser set! Use them or display them, either way you can keep them handy in their clear carrying case complete with a clip to hang onto your backpack, pencil case or even your lanyard. 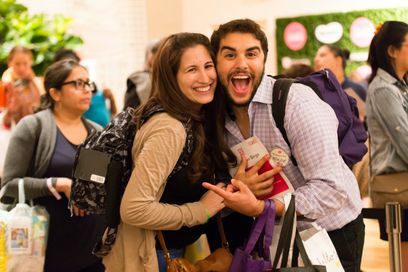 You buy, Yoobi gives – For every Yoobi item you purchase, a Yoobi item will be donated to a classroom in need, right here in the U.S.
A backpack made with your child in mind. The Classmate is available in a variery of styles and sizes to take your child from preschool to highschool. With padded straps, a water-repellent fabric, and an anti-tip design are features that will keep your child both organized and comfortable when carrying their backpack. The awesome-est way to carry all their books and binders? Inside this so-cuteit’s-scary snaggletooth monster backpack (duh!). We love this backpack that is the kids version of the iconic Kånken. The kids is the perfect size for your little one and can be carried as a backpack or a bag via the covertible straps on the top. The Kanken Kids is spacious and has a front pocket allowing for your child to have plenty of room for their school supplies and other personal items. If you’ve got a little one who loves to snack on a variety of foods, then this Bento Box style lunch box is for them. With five different compartments and two bowls for dips or wet foods, they will be sure to be satisfied after lunch time. Omie Box is different from anything that is currently on the market. It’s a lunchbox with a built-in vacuum insulated bowl, so parents can pack hot and cold food all in 1 box. Along with that, it contains 3 leak-proof compartments that keep food separate and mess free. It’s kid friendly, including special features that are so easy to use, kids never need to ask for help again. The only lunch box that packs hot & cold food together, so parents can send their little ones to school with healthy lunches. And best of all, it’s dishwasher safe! These lunch bags are superdurable and functional! Easier to tote than plastic or metal lunch boxes, our reusable lunch bags boast bold hues and are designed to keep food cool and contained. This smart collection features a water-resistant exterior, an insulated interior and straps on the back that attach to our backpacks. SoYoung lunchboxes are made of durable raw linen and best of all, they are machine washable! Each lunchbox comes with a leak proof insulated insert for easier cleaning and to help avoid staining from spills. There are so many designs to choose from, there is one that every child will like! Kids will love clowning around with our fun circus stasher! to use, simply store, heat, eat and wash—again and again. built to last, one stasher can replace hundreds of disposable plastic bags, so you can save money while you’re saving the planet. Snack in the Box is a patentpending, dual-chambered snack container equipped with two separate food chambers that are topped with pop-up lids for easy access. It’s durable, spillproof, leak-proof and is made of USA-made Tritan™ and Polypropylene. It’s also stain resistant and dishwasher safe. Each chamber holds 6oz of food. Bring sweet style to supply storage with this pencil pouchLets you store and transport pens, pencils, cosmetics and other everyday essentials. Shaped like an ice cream cone with a cartoon-inspired look to offer a fun, flavorful appearance wherever your day takes you. Made of polyurethane to stand up to the rigors of your daily life. Zipper keeps contents secure inside. Spread joy (not smears) with quickdrying Paper Mate InkJoy Gel Pens. With vivid gel ink that dries 3X faster* for reduced smearing, it’s like a party on the page where smudges aren’t invited. With 14 brilliant colors to choose from, your notes will be bright and filled with fun. Perk alert: these colorful pens are fully wrapped with a comfort grip (because words should never hurt you) and feature a smooth style that keeps the joy flowing as fast as your thoughts. Show off your personality with these awesome personalized spiral notebooks! Available at Lauren & Lola. We love the bright colors and big numbers on this ruler! No pencil sharpener needed. Enjoy all that Crayola’s colored pencils have to offer without the mess of sharpening them! Make nap time at school comfortable with this soft nap pad from Bedgear. It has a removable pillow and can even be personalized. Made with real fruit juice and plenty of water, our No Sugar Added range is a great option to help keep kids refreshed when running, jumping, playing and exploring every day. With so many flavours to enjoy, there’s always a different one to pop in the lunchbox or sports bag. But no matter how you mix it up, every bottle is free of HFCS and without any artificial flavors. Available in Vanilla Oat & Flaxseed, and Cinnamon Sweet Potato & Flaxseed flavors, each serving contains 160mg of Omega 3 (ALA), an important nutrient to help your Tot grow leaps and bounds, and only 2g of sugar, to help keep energy levels steady all day. The uniquely designed Sage Squeezie reusable food pouch stands up and stays open on its own! This allows for easy, no mess filling and thorough cleaning – no more stuck food in places you can’t reach. The Sage Squeezie is durable, reusable and super cute! This 3 pack of Sage Squeezies is the perfect food pouch for baby food as well as healthy snacks for toddlers and big kids. Each pouch has a convenient 7oz capacity and there’s no need to spend money on an additional filling station! The Sage Squeezie can be easily filled with a spoon or poured directly from your Sage Baby Puree & Blend food processor or bowl. Great for little hands on-the-go! Just fill with your child’s favorite smoothie, yogurt or other healthy treat and you’re good to go. Doubles as a freezer pack to help keep school lunches fresh – will defrost just in time for lunch! Freezer and dishwasher safe! FDA and CPSIA approved – BPA, Phthalate, Lead and PVC free. Patent Pending. At Earth’s Best® brand, we bring you THE BEST FROM THE EARTH. Our certified USDA Organic fresh & ripe strawberries, blueberries, raspberries and blackberries are flash frozen so you can enjoy seasonal favorites year round – no artificial colors, flavors or ingredients added. Once removed from the freezer, our portable fruit cups conveniently thaw and are ready to eat by lunchtime. Available at Target, Prices Vary. Ella’s Kitchen Organic Aloe Juice Blend Drink, Blueberry Apple, 8 Count. Hello, I’m just a yummy refreshing aloe water drink with organic blueberry, apple and lemon juice not from concentrate. My ingredients are suitable for explorers of all ages, from 1 year olds to 101 year olds! My handy packs are great for picnics, lunch boxes, shopping trips, car journeys, adventures, after school activities or just at home. I taste best when chilled and shaken. Make sure my straw is inserted properly before drinking. Give me a rest in a cool cupboard or chill me in a refrigerator prior to serving me. Once opened, you must store me in the refrigerator and drink me up within 3 days. Warning: I’m not suitable for little people under 1 year old. When a child is over 1 year, always make sure they are sitting down and supervised by a grown up. My straw could be a choking hazard for little ones. Available at Ella’s Kitchen, Prices Vary. A team of five lovable little detectives who use their special sleuthing skills and detective gear to help kids navigate the emotional maze of childhood. If feelings are on the line, the Moodsters are on the case! Available at Amazon.com, Prices Vary. Tap into big fun with the amazing, allin-one leap start interactive learning system for kindergarten and 1st grade, jam-packed with key school and life skills for inquisitive 5-7 year olds. The system works with a library of replayable activity books (sold separately) and comes with a kindergarten and 1st grade sampler book. The leap start interactive learning system is designed to help build key skills and challenge kids to get ready for their next step in learning. Get kids excited about everything from STEM to social skills, reading comprehension to Communication, and problem solving to scientific thinking with replayable activity books bursting with fun on every page. Sizes 24-33Microfiber suede and sparkle textile upperBreathable mesh liningFlexible rubber soleCasual style with Velcro closureFit: Runs 1/2 size largeApproved by the American Podiatric Medical Association for promoting healthy foot development. An adjustable strap tops this cute canvas sneaker, softened up with padding around the top and in the tongue. Crisscross accents add an extra pop of color. This season, Splendid blends its signature softness with bold prints.The result: a perfect mix of comfy, functional pieces with fun, graphicflair. The range also includes classic essentials for their closet—thinkeveryday tees, wear-with-anything knit bottoms, warm jackets and more.With these soft, stylish pieces, your Splendid Littles will be set totake on the school year in stride.